If you have an existing mortgage, you should review it regularly to make sure you’ve still got the most suitable deal for you. You also need to know that if you are on a fixed rate mortgage you may be automatically switched to a Standard Variable Rate when the term comes to an end. If you don’t have your mortgage reviewed you could find this is costing you more than you need to pay over the term of your mortgage when comparing with a new fixed rate term. We are delighted to announce that John Smith has been promoted to Head of Paraplanning. In May 2016 John was promoted to the position of Senior Paraplanner. He joined Four Oaks Financial Services in January 2015 as a financial adviser but then switched roles and joined our in-house Paraplanning team as a trainee and quickly showed his aptitude for this work. John has worked in financial services for many years having been a financial adviser for West Bromwich Building Society, HSBC and Lloyds Bank. Owing to his exceptional experience, accuracy and communication skills especially with our financial advisers John has proven himself to be a valuable member of our senior team based at our offices in Shenstone Wood End, near Sutton Coldfield, Lichfield and Tamworth. Two years ago one of our clients suffered a major heart attack. This was out of the blue and he found himself in hospital in Stoke for a number of weeks. Whilst there he wondered how long it would take him to walk home. 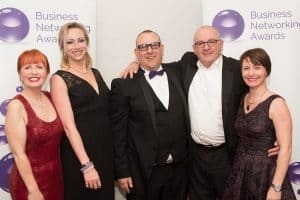 Last year he found out, because he did the walk with a group of local business people, including our MD Martin Ward and Protection Adviser David Jones, raising a staggering £10,000 for charity. David has volunteered to do the walk again and this is taking place on the 30th April. David who is an active member of the Army Reserves will not only be walking but he will also be helping to look after the other walkers feet and wellbeing during what is a grueling day, last year taking over 14 hours to complete the walk. By clicking on the above links, you are now departing from the regulatory site Four Oaks Financial Services Limited. Neither Four Oaks Financial Services Limited nor Intrinsic are responsible for the accuracy of the information contained within the sites. We are very proud to be working with the Buddy Bag Foundation as our nominated charity. 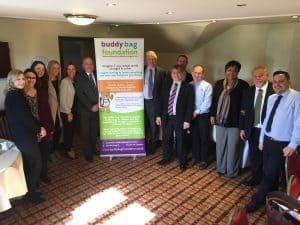 Buddy Bag Foundation works across the UK to help children who have to leave their homes, often as a result of domestic abuse or violence, and they literally leave with nothing but the clothes they are wearing. Buddy Bags are backpacks that contain essential things the child will need such as toiletries and underwear, but also a teddy bear and other items that they can call their own. The aim of the Buddy Bag Foundation is to help restore a sense of safety and security into a child’s life during what is a traumatic time. Alan Woolford was the first Adviser to join Four Oaks when we worked from a small office in Aldridge. That was five years ago and Alan’s commitment to the Practice has been celebrated with a long service gift of a new laptop which was presented to him at a recent team event. Alan is a well-known networker in the local area and is a member of Burntwood Business Networking Group.